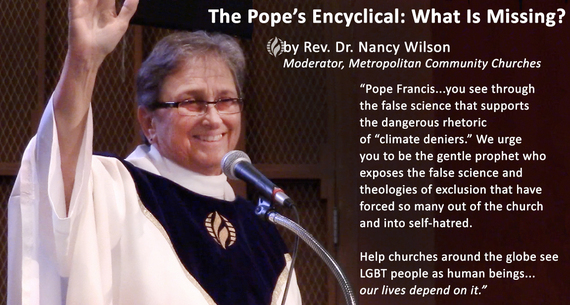 The Pope’s Encyclical on Climate Change — What is Missing? Pope Francis, when you arrived for the first time in the United States, it was my privilege to be among the throngs of people welcoming you to our home. It was so gratifying to know you would be visiting a prison, and addressing the U.S. Congress, and the United Nations on Climate Care. Your challenges to people of faith to address the needs of the poor inspire me to say YES to you as a Pope of the people. Your encyclical, LAUDATO SI’: On Care for Our Common Home, will help the world of faith and civil society face our climate crisis caused by human beings. Your passionate insistence on facing the facts, with faith and courage, is truly a miracle of our time. Your work to galvanize people of all faiths to shift away from a fossil fuel dependent world could literally save us.